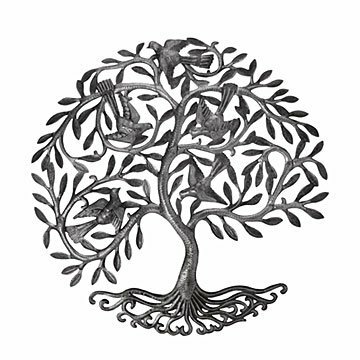 An ancient symbol meets modern materials in this steel Tree of Life sculpture. Haitian artisan Jean Roosevelt Beauchard renders this wall relief from a surprising source: steel oil drums. Drawn from Norse, Biblical, and other world traditions, the Tree of Life is an ancient symbol of the intertwined richness of the natural world and has inspired artists from cathedral mosaic craftsmen to Gustav Klimt. Starting with retired 55-gallon drums, Jean removes both ends, burns away the oil residue, slices the cylinder down one side, and pounds it into a flat sheet. He draws his intricate design onto the metal with chalk, then uses a hammer and chisel to cut, shape, and contour the sheet into a piece that balances sophisticated detail with rustic, handcrafted charm. The design naturally provides multiple points for hanging (hardware not included). The sculpture is finished with a protective clear coat but is intended for indoor use. Handmade in Haiti. Jean Roosevelt Beauchard still works in the Haitian village near Port au Prince where he was born. He began studying as a metal artist at the age of nine under the tutelage of Hubert Bernard, and created his first commercial pieces at the age of 15. Those first pieces were Tree of Life designs, the same motif he continues to render to this day. Three years later, Jean opened his own workshop while continuing his formal studies. He has personally exhibited, through the sponsorship of Aid To Artisans, in Honduras and New York. Beauchard has been mentored by the renowned Haitian artist Serge Jolimeau, and today serves as Beyond Borders supervisor in Haiti. Bought this as a Birthday gift for my daughter. She loves it. I will be buying another soon as a wedding gift. Looks great. What came is a darker metal than shown (more of a pewter) but still very beautiful. I thought this would be heavy and thicker.I love the birds on branches and how the tree is easy to place on wall. It is beautiful and every person I gave it to was delighted, touched and happy. The quality of this piece is what really blew my mind. I'd worried it might have rough, unfinished edges. But, nope, it's all 100% smooth, finished, and gorgeous. Perfect gift for someone who collects all kinds of trees!! I'm excited to give this to my mom for Christmas this year! It's going to look great on one of her walls! One of my friends and colleagues is a plastic surgeon who spends several weeks a year in Haiti training young surgeons and performing life saving operations on needy Haitian patients. He does this on his own time with no financial assistance from any organization and has done so for many years. The tree of life represents his gift to these people. The fact that it is sculpted by a Haitian artist made it the perfect Christmas present. I'm looking forward to giving it to him this holiday!